A historical site about America's favorite airport. Hello and welcome, this site is dedicated to one of my favorite places on Earth. Tampa International Airport is known around the world for its magnificent Landside/Airside Terminal. Since its dedication in 1971 travelers and the media have praised this beautiful jetport. 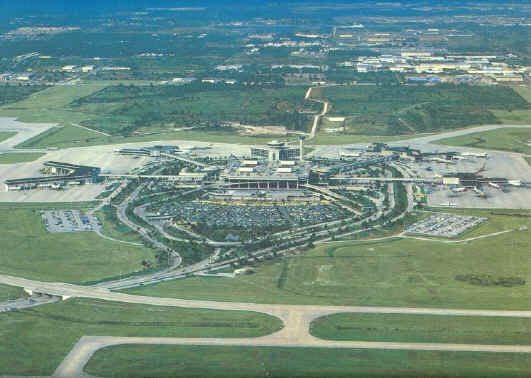 Many years ago I saw a photo of Tampa International Airport’s beautiful Landside/Airside Terminal in an aviation book. This spectacular aerial photo sparked a lifelong interest in TPA. I wrote to the Hillsborough County Aviation Authority and they were kind enough to send me plenty of wonderful material. My first visit to Tampa took place in 1977 when I flew there in an Air Florida Boeing 727. My brief visit to the terminal was a thrilling experience. I returned in 1980 and spent the entire day exploring the terminal and riding the old Westinghouse C-100 shuttles. Since then I have made it a habit to visit TPA as often as I could. Landside/Airside Terminal 1961-1979 The history of the world's finest airport terminal. West Shore Terminal The story of TPA's old terminal building. History of Airfield Infrastructure The story of non-terminal facilities at TPA. Golldiecat's Airport-Page A historical site about the great airport terminals of the Southeast. If you have any comments or suggestions please feel free to send me an e-mail.